Anoto provides digital pens and ditto patented camera-readable pattern that can be used for pointing, writing and learning. 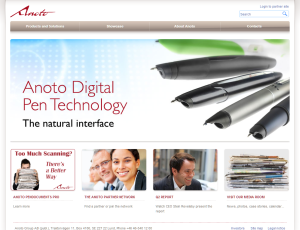 Anoto also provides a range of different applications supporting the pens. Anders acted product manager on consulting basis for the pen products during the transfer of the production responsibility from Maxell in Japan to Sweden and during the start-up of the whiteboard product range. The assignment was handled via Netville AB.